Yes, ice cream lovers, there really is an ice cream trail, and this year Maryland’s got nine stops for you to check out. MOUNT AIRY, Md. — Yes, ice cream lovers, there really is an ice cream trail, and this year Maryland’s got nine stops for you to check out. 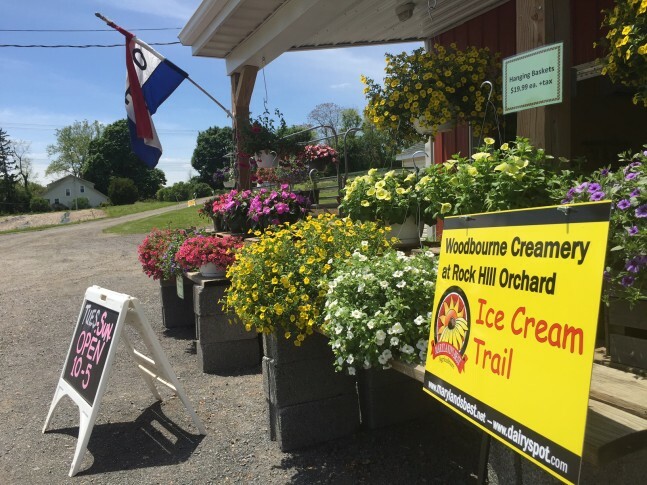 This year, the Maryland Ice Cream Trail spans from the Chesapeake Bay to the Catoctin Mountain region. Visit all nine creameries between Friday and Sept. 23 and you will be declared an Ice Cream Trail Blazer. Maryland’s ice cream season was kicked off Friday at Woodbourne Creamery in Mount Airy, where farmers John and Mary Fendrick’s herd of Guernsey cows produce rich, delicious milk with a high butterfat content. It’s that butterfat that gives the ice cream its velvety texture. Visitors were invited to tour the milking parlor just up the hill from the farmstand off Ridge Road. Maryland’s Deputy Secretary of Agriculture Jim Eichhorst took on the tough chore of taste-tester. His selection? “Peach,” he said, bypassing the Grand Marnier and rich chocolate flavors. After that, it was tough to get a comment out of him. His ice cream was beginning to melt and he needed to get back to work. Bill Lynch, whose title really is Ice Cream Chairman of the Montgomery County Fair, dug into a sample of the chocolate ice cream. He said ice cream from the farm’s golden Guernsey cows was delicious, but was adamant about flavor selection. “Chocolate, which is the only kind they should make,” he said. Maryland Agriculture Secretary Joe Bartenfelder was more diplomatic when asked if he had a favorite flavor. “I like them all,” he said. It is, after all, ice cream we were talking about. Bartenfelder said his goal was to hit all nine creameries to test all the ice cream. John Fendrick said that you won’t hear a whole lot of mooing from the herd because contented cows don’t moo much. And his cows are contented. The grass-fed cows are out in the open air and get to choose when they want to be milked. They stroll in and out of an automated milking parlor at their leisure. And by automated, the Fendricks mean fully automated. The cows file into a milking parlor through turnstiles. A robotic milking machine cleans the cows udders, attaches the milking apparatus, and extracts the milk from the cows that stand quietly and calmly while being milked. How do you get a cow to tolerate a robotic milker? Mary Fendrick said each cow has its own motivation. Some simply like the relief that comes from emptying a full udder, others like to get in to get a treat of grain, and then there are the cows that tend to simply — follow the herd. Mary Fendrick said it’s like kids noticing that everyone else has gone off to play. For the full list of stops, visit the Maryland Department of Agriculture’s Maryland’s Best website, Marylandsbest.net.